This compote seems to have an affinity for anything with lots of pepper or a little spice. I’ll use it over pork chops, chicken or salmon. It’s also great as a little topping for crackers spread with a dab of goat cheese or cream cheese and the tartness goes well with a rich, vanilla ice-cream or a sweet cake as a dessert sauce. I don’t know about you, but for years I avoided a lot of dishes containing cherries – they often seem overly sweet, even “gloppy.” This recipe is nothing like that – it rides the edge where savory meets sweet, leaning slightly to the sweet side, while still remaining a little tart. Dried cranberries make an excellent substitute for the dried sour cherries, especially if they are not sweetened, and are much less expensive than cherries. Cherries, though, are always my first choice. While this sauce is a bit more tart with sour cherries (which have a very short season and may be hard to find) it’s also excellent with Bings. A few drops of red wine vinegar is great in the dish if you’re using a sweet cherry. The brandy, though, really “makes” the recipe. It blends so well with the other ingredients, you’ll hardly know it’s there but it gives a little roundness and depth. I’ve canned this recipe before very successfully. It’s so nice to have a jar at the ready in my pantry. If you do so, don’t use any of the cornstarch until you’re ready to serve. 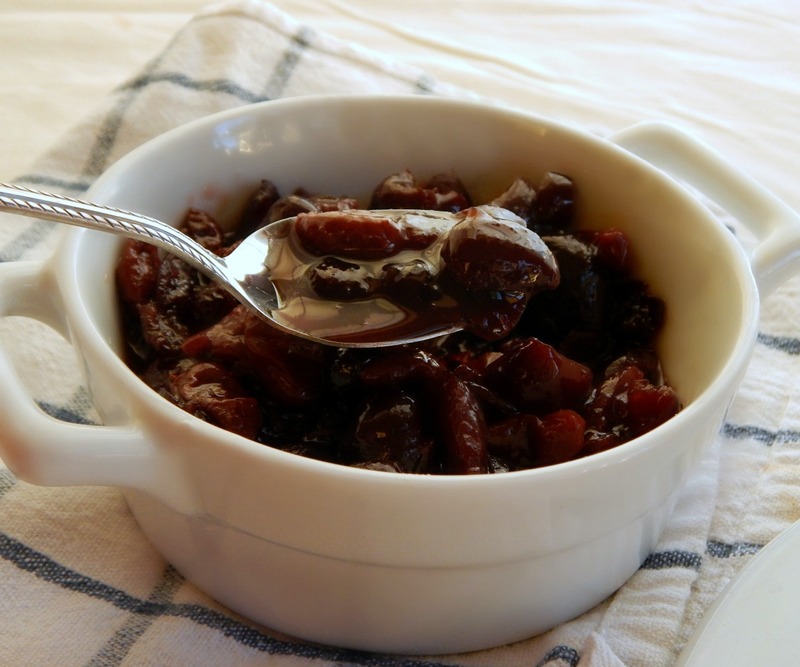 Bring cherry or berry juice and dried cherries to a boil in a large, heavy bottomed pan. Remove from heat, cover and let steep 20 minutes. Bring dried cherry mixture back to a simmer. Add the fresh cherries and sugar, simmer until the cherries begin to soften, about two minutes for fresh, about five if using frozen. Mix cornstarch and brandy in a small bowl or cup until blended. Add to the cherry mixture, stirring constantly. Bring to a boil over medium heat and stir until the mixture thickens, about a minute. Note: if unable to use tart cherries, add a few drops of red wine vinegar to taste. Cherries: While Cherries come into season mid to late summer in my area, they’re always available in the store – they’re just better and cheaper in season. They’re sometimes as low as 99 cents a pound, and like grapes seem to have a sale all their own: our store often sells the 1st pound free. Watch those sales carefully; the first pound may be free, but sometimes the per pound price may so high that you pay more in the long run if you go much over the free pound. By the way, even if prepackaged you’re not required to buy the whole amount so you can work those sales to your advantage. The packages at my store this week with the free pound worked out to 2 1/4 pounds and would have cost about $5.00, which was $2.77 a pound. I opened mine and removed about a third so I had the pound and 1/2 I needed, so paid $1.38 for my total pound and a quarter. Dried Cherries: Stock up during Christmas – and use coupons. If the bag is flimsy, repackage. Dried fruit keeps, literally, indefinitely, although you might find it becoming almost hard. Use the same trick as for brown sugar – keep it overnight, sealed in a bag with a piece of bread. Your pricing will vary according to what you use, cranberries or cherries. Aldi’s sells 4 ounces, about 2 cups for $1.19. Cost 60 cents. Sugar: Look for sugar on sale, which usually happens around the holidays. While any holiday generates a sales price, the best sales are generally from Thanksgiving to Christmas, when coupons are abundant. 1/2 cup is about 4 cents. Berry or Cherry Juice: Either can be a pricey ingredient, especially the cherry juice. If you’d like the cherry juice, consider looking in the baby or health food aisle. For berry juice, try to stick with a natural or no additive 100 percent juice. This is an item that one can often find $1.00 off coupons for, and combined with a sale can be picked up for pennies. Cost 10 cents. Per Serving, servings 10 1/2 cup each: 126 Calories; 0g Fat; 1g Protein; 30g Carbohydrate; 2g Dietary Fiber; 0mg Cholesterol; 4mg Sodium. Since this can go well with savory of sweet items, left overs shouldn’t be too much of a problem. I like a dollop in my plain yogurt and this is excellent in or over Over Night Muesli. If you are sauteing chicken or pork in a pan, consider soaking the dried cherries as you are cooking your meal. When the meat is finished, drain excess oil in the pan, saute a finely diced onion, then add the soaked cherries and juice. Proceed as directed. If I change this compote into a pan sauce like this, I generally cut the amounts in half or less – while the recipe made as normal will keep for quite some time in the fridge, if it is combined with the drippings in the pan, for safety reasons, you’ll only want to store it in the fridge for a few days. Reposted 12/5/16 from an earlier post. I’m going to be sharing these marvelous rolls this week on our very own Throwback Thursday as well as Saucy Saturdays and Fiesta Friday! Fiesta Friday is hosted this week by ! Linda @ La Petite Paniere and Jhuls @ The Not So Creative Cook. This entry was posted in Click here for Fabulous Food Posts and tagged Alcohol, Appetizer, Cherries, Condiments, cranberries, Dessert Sauces, Desserts, Dried Fruit, Fruit, Sauce, Side, Spreads and Dips. Bookmark the permalink. Hi, I make another compote with wine, but cherries & wine are classic, too. There’s a Cherry Brandy, but the ones I’ve tried have been really sweet and almost cloying…The sour cherries in this are just perfect! Molly the compote sounds so delicious!! I forgot to say the jarred cherries would be just fine in this. I love that you named your pup Snickerdoodles! How adorable is that??! I just use the same old basic recipe that has been around forever! I want this in my mouth! yum! Oh hush!! Lol! Yes it would!! Sweet and tart combinations always grab my attention 🙂 and with a splash of booze thrown in, how could I say no to this? 🙂 Lovely! I’m the same way! 🙂 Thanks, Loretta!